Home » content marketing » facebook » social media » video » Is your brand ready for the Live Video trend? How to use Facebook Live, Periscope, YouTube and Meerkat. Globally, top brands are already using live video. We've seen multi-event product launches from sportswear brand New Balance. The home furnishing brand Pottery Barn is riding on holiday trends and interests to create spectacular online events. Quality content adds value for viewers and can improve brand loyalty. Pottery Barn creates the perception of cool, useful content by asking viewers to register for “exclusive access” and by sharing Facebook promos with in-house designers. Interestingly, most brands using live video are using their own employees for content, instead of hiring professionals. That keeps costs down and delivers an effective, trustable message. News channels, of course love the trend. Even before they jump on Facebook live, they've been using Periscope. Periscope, which recently celebrated its first birthday, estimates that 200 million broadcasts have been created on Periscope so far and over 110 years of live video are watched every day on Periscope via iOS and Android devices. Live video is changing user consumption of news and entertainment and is further connecting TV and social media. More brands and news organizations are using live video to augment their digital reach. And, now Facebook Live is impacting the whole spectrum as a platform both for real-time storytelling and journalism. Sujay Nanavati, Regional Business Director at MullenLowe MENA, a leading creative agency in Dubai, leads the Unilever business at his agency. He believes that there is a huge opportunity for some of the brands he works with. 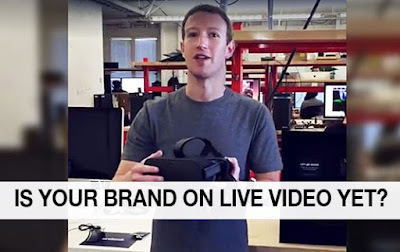 "We've done live streaming on YouTube mastheads before, but with these new platforms – particularly Facebook Live, it's going to become a lot easier for us to do launches, special events, activations, product usage updates and more". Nanavati has already seen a demo of how Facebook Live can be used, and believes that it brings a wide spectrum of live content opportunity at the hands of someone who has a good grasp of content, can operate a good quality camera phone and speak convincingly and interestingly. You can broadcast Facebook live through profile or the 'mentions app' and it is simple. You can just click the update status button and then click on Live icon. Write a quick description in the status update box and description will be visible in the news feed. Select your audience before going live and then tap on Go Live. Then point the camera to yourself or to your event, your demo, your unboxing – in order to catch the video. During the broadcast you will be able to see number of live viewers and which friends are turning in and which are commenting. All of this data will be visible in real time. After you’ve ended the broadcast it will be visible on the news feed like any other video. You need to have quality content – so do pre-plan. Make sure audio quality is good. Have a compelling title to your video – that's what people will see first. While short form is a good place to start, your live broadcast ideally, should be around 5 minutes to hold attention and create audiences. Your live video content strategy needs to be a mix of what you want to say directly about your product or service – and a balanced view of what people would want to know about your brand – like an inside story. It is storytelling, after all. Q&As. Do Q&A sessions regularly. Your audience will know you will be available to answer questions, and they will like the straight-on live approach. It is an open platform for them. To get even more out of it, plan ahead. Create an event and encourage people to ask questions in advance, so you know what to address in your live stream. This will give you tremendous material for future content. Product demos. Do live product demos and unboxings. Launch your new product live! Show people how to best use your product or the really cool features. As with all video, you want to be having fun as you do demos, so your audience has fun too. How-Tos. Show your audience how to do it simply, easily and usefully. Breaking news. Share new interesting news about your brand, your brand vertical, your industry. Become a go-to source of live news that audiences can anticipate. Report news and also add your own thoughts and opinions, so people know what to do with that information. Is Live Video for you? Well, it's what you make of it. You can start with small experiments – doing quick tests and 'narrowcasting' to a select audience and get feedback. While not every brand needs to jump in immediately, there are enough opportunities for the right kind of live content for most brands. Let's face it, video is already big. Huge. And, by going live, you'll bring a sense of the here-and-now to your content. Update April 14: See Facebook's F8 conference focus on Live Video. Are you ready for it? The problem with brands doing live video will be a sacrifice of quality in trying to create so-called live content. Brands will of course jump at the new opportunities, but getting true live content is difficult. One more point: I do not agree that live video can be produced by employees as you suggest. So, being able to produce good live videos will be expensive.